The Federal Supply Group (FSG) which is the first two Digits in the NSN number identifies, by title, the commodity area covered by classes within the group. Currently we list 78 federal supply groups, which are subdivided into 645 federal supply classes (FSC). The Federal Supply Group (FSG) identifies, by title, the commodity area covered by classes within the group. 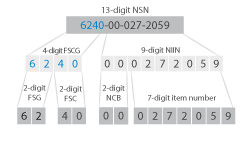 The Federal Supply Classification Group (FSCG) utilizes a four-digit coding structure. The first 4 digits of the NSN number identify the classes within each group. The structure of the FSCG, as presently established, consists of 78 groups, which are subdivided into 645 Federal Supply Class classes. Each class covers a relatively large and mixed area of commodities. 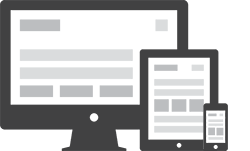 Military aircraft structural components, mil-standard hardware and fasteners, test stands, and aircraft line replacement units and subassemblies. These parts do not have NSN's associated with them.